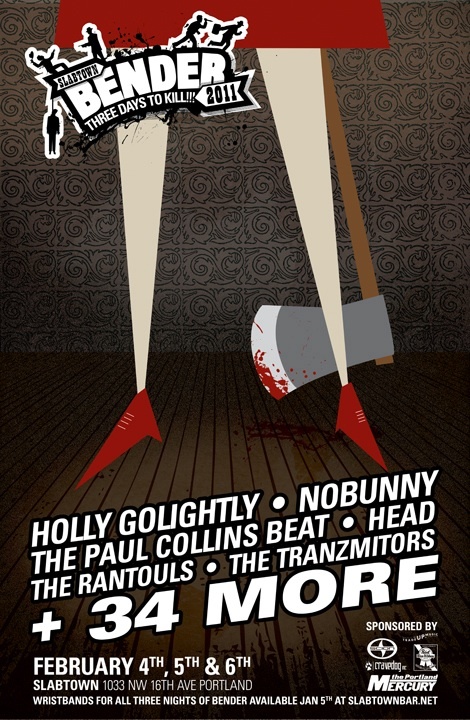 Slabtown has just released the line up for their 2011 Bender with Paul Collins, Nobunny, and Holly Golightly headlining. The 2010 Bender was awesome and I expect nothing less than that this year. I've got a month to familiarize myself with the lineup and plan my weekend. Like last year, it's a mix of old favorites (Pure Country Gold, Pity Fucks, etc.) and bands I've never heard of, so once again I've hunted down most of their homepages and included the band's rough genre based on the few songs I heard. By the 4th I should be ready. Liquorball (Bay Area?) psychedelic rock? So far, Apache and the Tranzmitors are my two favorite new-to-me bands off this list.